All kinds of vessels, regardless of their flag states and tonnage, might enjoy the right of innocent passage through the territorial sea of Vietnam, provided they respect peace, independence, sovereignty and law of the nation and treaties to which Vietnam is a contracting party, as well as the Minister of Transport’s principle of preventing collisions at sea. Such requirement is set out in a draft decree designed by the Ministry of Transport to provide the announcement of sea lanes and traffic separation in the territorial sea of Vietnam. According to the draft, when passing through the territorial sea of Vietnam, vessels would have to fly the Vietnamese flag on the top of the highest mast, run constantly and fast and fully observe relevant provisions of Vietnamese law and the 1982 United Nations Convention on the Law of the Sea, unless they get involved in marine incidents, force majeure events or distress or rescue humans, vessels or aircraft in distress. 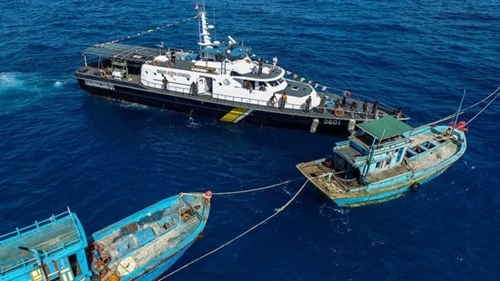 Foreign submarines and other underwater vehicles must float on water and hang the Vietnamese flag next to their national flag unless otherwise permitted by the Vietnamese Government or agreed upon between the Vietnamese Government and the governments of the flag states. When operating in the Vietnamese territorial sea, nuclear-powered foreign vessels or vessels carrying radioactive, hazardous or dangerous substances must bring all technical documents related to the vessels and cargo on board and documents on compulsory civil liability insurance for production to Vietnamese competent state agencies upon request.